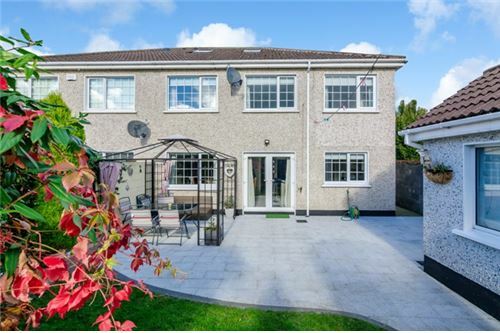 New to the market with Tony Donnelly of RE/MAX Partners Leixlip, 1 Glen Easton Way is a super five bed semi detached property with double extension to the side and attic conversion. 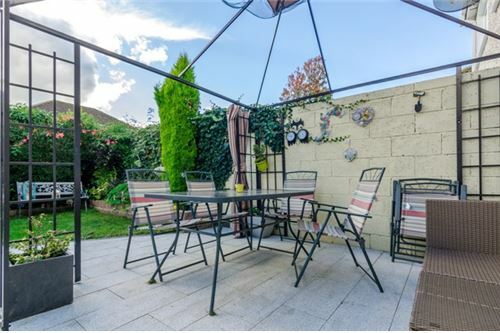 Presented in superb order throughout, this is a thoroughly modern home with excellent living and bedroom space and the added benefit of a South West facing rear garden. 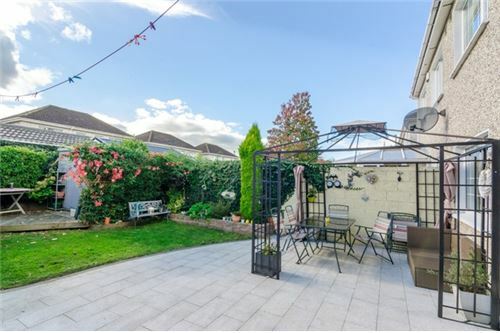 Located to the front of Glen Easton, this property is only a few minutes’ walk from all amenities, Louisa Park train station and Leixlip Town and a short drive to the M4 motorway& Intel. 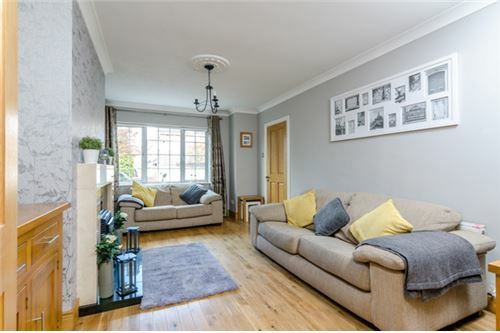 Extensive living space including a well proportioned lounge with solid fuel stove with double doors leading to the open plan dining room and contemporary high gloss kitchen with separate utility room. 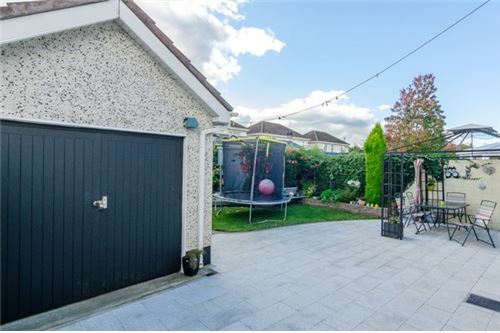 Converted garage downstairs currently used as a family room but would work equally well as a bedroom. 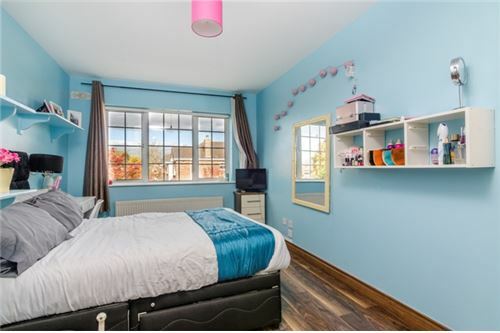 Upstairs are two extra large double bedrooms , master with ensuite and two additional doubles. The family bathroom and ensuite have been upgraded with high end décor and sanitary ware. 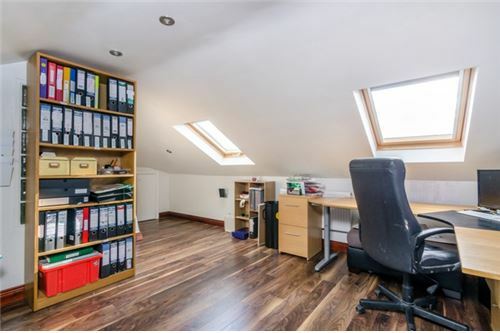 The attic has been converted and is an excellent bright space currently used as an office but equally suitable as a storage / playroom or gym. 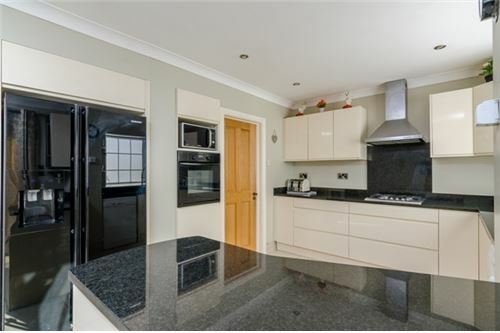 This is an exquisite property completed to an exacting standard in a very contemporary way. 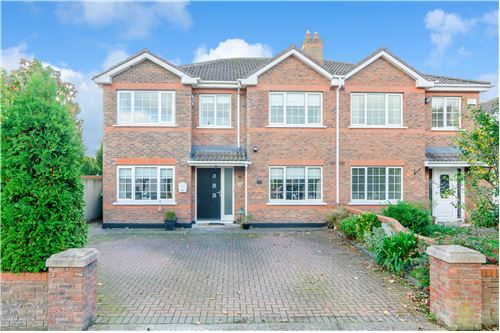 Don’t miss it – viewings are by appointment through the Leixlip office 01 629 5060 – evening and Saturday viewing accommodated. 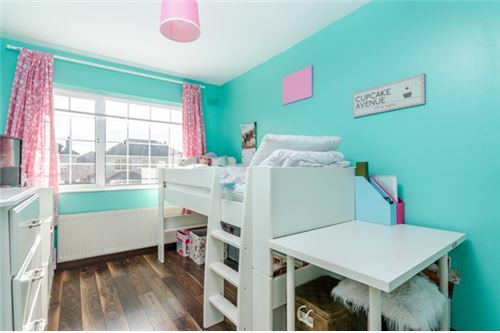 SQUARE FOOTAGE: c. 1800 sq. 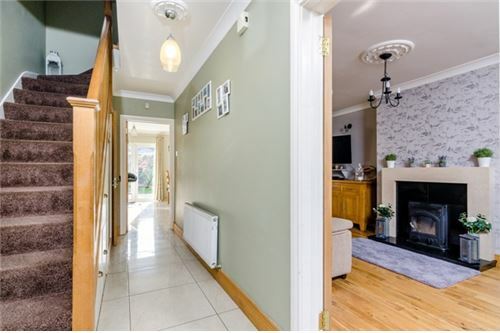 ft.
c. 17’6” x 6’6” Coving, centre rose, light fitting, downstairs smart storage, Porcelain tiled floor. 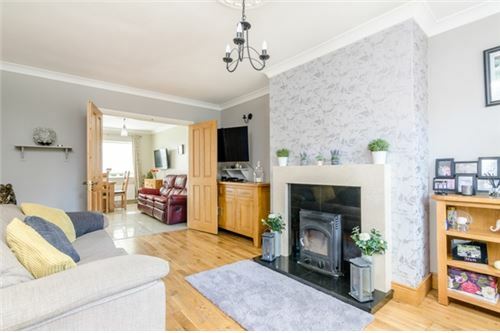 c. 16’6” x 11’6” Coving, centre rose, light fitting, wall lights, white marble feature fireplace with tiled inset and polished hearth, insert solid fuel stove, curtains, blinds, solid oak wooden floor, TV point, Sky cable TV, phone point, double doors leading to dining & kitchen area. 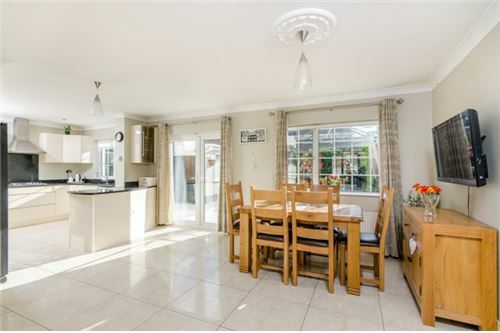 c. 26’6” x 13’9” Coving, centre rose, light fitting, recessed lighting, high quality high gloss kitchen, granite worktops & splash back area, stainless steel sink, area plumbed, American fridge freezer, dishwasher, oven, hob, extractor fan, wine rack, crystal display cabinet, breakfast bar, French double doors leading to garden area/patio area, ceramic tiles, TV point, phone point, microwave, curtains, blinds. 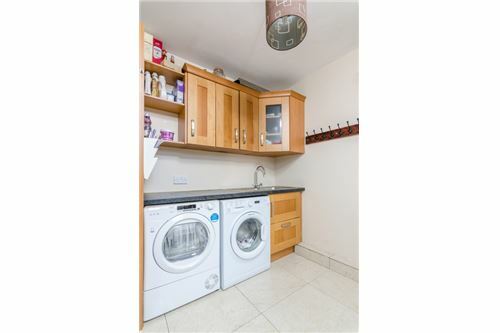 c. 7’6” x 6’0” Light fitting, fitted units, stainless steel sink, area fully plumbed, ceramic tiled floor, back door leading to garden area. c. 5’6” x 2’6” Light fitting, extractor fan, WC, WHB, fully tiled, WC, WHB. 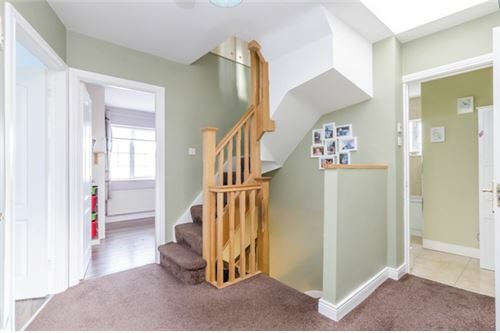 c. 12’0” x 9’6” Light fitting, dado rail, full attic stairs, attic full converted. 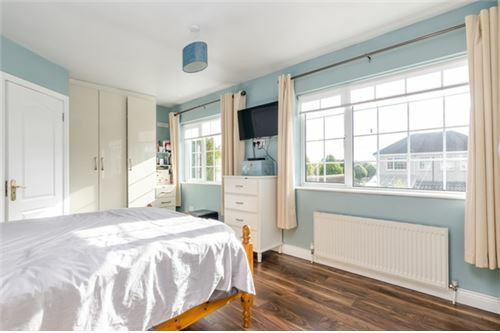 c. 18’0” x 11’6” Light fitting, wall lights, high gloss fitted wardrobes, blind, curtains, walnut wooden floor, TV point, phone point. 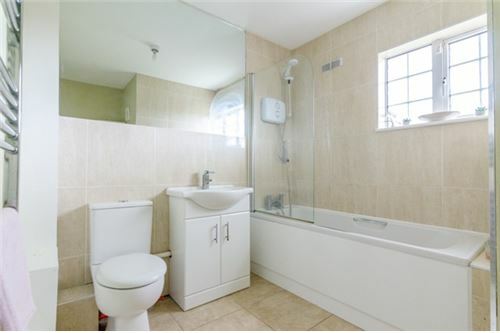 c. 8’0” x 4’6” Light fitting, floor tiling, wall tiling, shower cubicle with power shower, WC, WHB, heated towel rail. 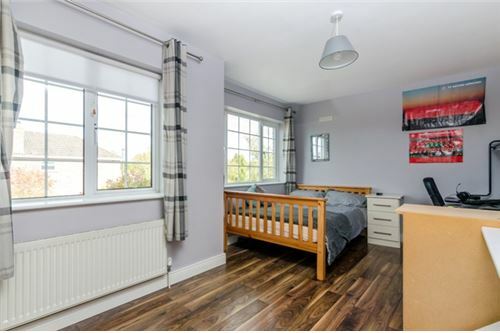 c. 17’6” x 10’6” Light fitting, fitted wardrobes, blind, curtains, walnut wooden floor, TV point, phone point. c. 15’6” x 9’6” Light fitting, fitted wardrobes, blind, curtains, Walnut wooden floor, TV point, phone point. 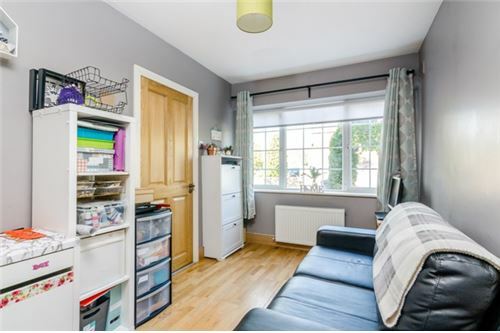 c. 14’0” x 8’3” Light fitting, fitted wardrobes, blind, curtains, wooden floor, TV point, phone point. 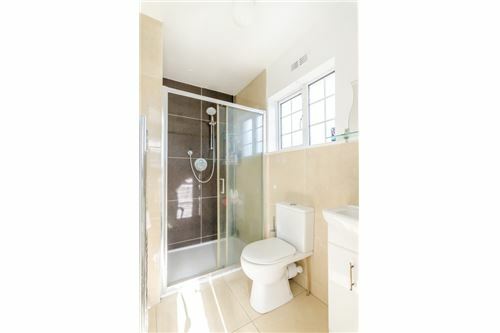 c. 9’0” x 8’0” Light fitting, heated towel rail, fully tiled, WC, WHB, electric Triton T90 shower, bath. 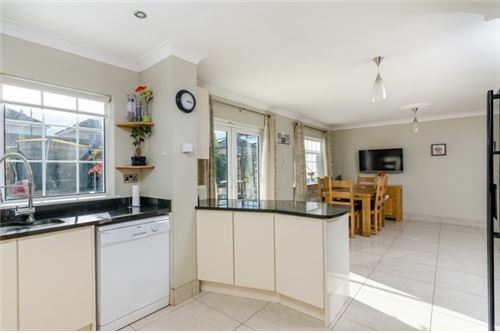 c. 15’6” x 14’6” Light fitting, recessed lighting, fitted shelving, Velux windows x 2, blackout blind, wooden floor, TV point, phone point. 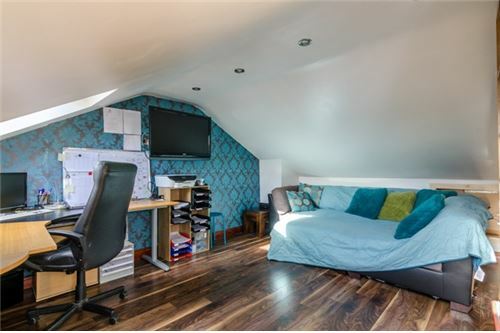 Bedroom/Study: c. 13’6” x 7’6” Light fitting, solid oak wooden floor, TV point, phone point, features a bay window.